Will Oakland Become First U.S. City To Ditch Wall Street And Establish A Public Bank? Proponents say an Oakland bank could rake in billions of dollars from the marijuana industry. 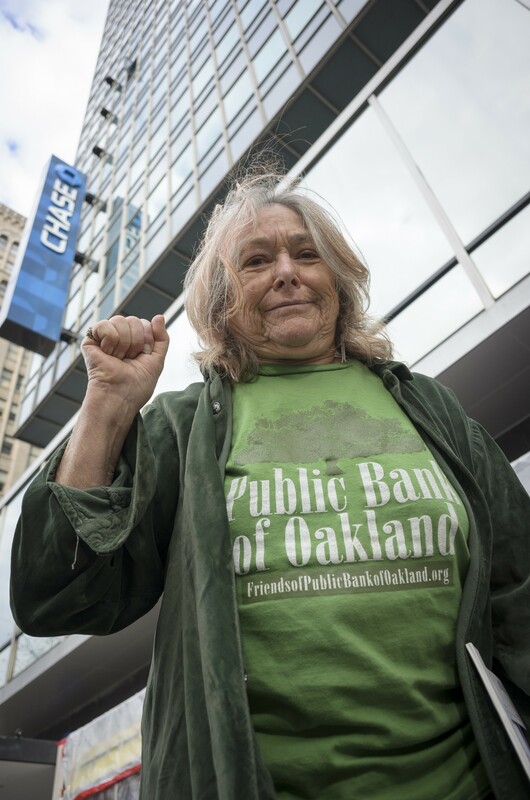 Activist Susan Harman is urging the city of Oakland to leave Wall Street and establish its own public bank — a move that, after years of discussion, actually might happen. It started with a conversation over dinner. In 2011, retired local principal Susan Harman was in Washington, D.C., protesting Citizens United, and she happened to be seated next to public-banking advocate Ellen Brown. It didn’t take long for Harman to be convinced that a public bank would be the best way to challenge Wall Street’s influence — and she immediately took the idea home to Oakland. Now, she’s a leading member of the advocacy group Strike Debt Bay Area, an outgrowth of the Occupy movement that has continued to protest financial corruption, and has been fighting for public banking ever since. It hasn’t been easy — especially after Gov. Jerry Brown killed an initial state-level campaign — but six years later and Harman might finally witness a public-bank reality in her hometown. Oakland is now considering establishing one of the first city-owned banks in the country. Officials argue that the bank could provide affordable financing for city initiatives, small businesses, and low-income residents. Oakland’s bank could also accept the billions of dollars in capital from California’s cannabis industry, which cannot deposit money at commercial banks due to pressure from the feds. “Public banking is a great way for us to put our money where our values are,” Councilmember Rebecca Kaplan told the Express. She emphasized that people are tired of fighting to keep Wall Street banks in line, especially now that the Trump administration has begun to roll back regulations. “I think that has been so frustrating that it has increased the appetite for a community-responsive alternative,” Kaplan said. But the councilmember admitted that it has been difficult to cut ties to big corporate banks, despite the swelling public support for divestment. Oakland must put its money somewhere, and the big banks that apply to do business with the city all have tarnished track records. Ideally, a public bank’s charter and mission would be to serve the public, unlike corporate banks, which are responsible only to shareholders. As a result, Kaplan says, the bank’s directive would be governed by the people, rather than profits, and it could finance a variety of opportunities, from low-interest college loans to investment in alternative energy infrastructure — all while saving the city money. Two weeks after the November 2016 election, Kaplan and Councilmember Dan Kalb introduced a resolution that began the process of assessing what it would take to establish the bank. Now, City Administrator Sabrina Landreth is evaluating two bids from organizations willing to conduct a feasibility study, and is scheduled to present her decisions, along with how much a study will cost, on April 25. While the idea is only in early stages of development — and there are still many unanswered questions — this could be a big win for public-banking advocates, who have high hopes that city-run banks will spur larger regional and state-level public banks. Oakland is one of several of cities, including Santa Fe, Philadelphia, Manchester, and New Hampshire, that are assessing the potential of a public bank. While there aren’t currently any city-owned banks in the United States, local governments around the country are looking at The Bank of North Dakota as a model. That state-run bank, which has thrived for nearly 100 years, helped North Dakota escape the credit crunch caused by the Great Recession, and, in the last two decades, added $385 million to its general fund in returns. Santa Fe has already completed an initial feasibility study, which it published in January 2016, and found that, though there are risks, building a public bank would be both feasible and fiscally advantageous. And advocates say that Oakland is better situated to succeed, due to what could amount to billions of dollars in capital from California’s newly legalized cannabis industry. According to California’s legislative analyst, the marijuana market is projected to grow to close to $7 billion over the next three years — and some estimates have projected the number closer to $20 billion. Still, 70 percent of businesses in the marijuana industry have been unable to open bank accounts. This has left businesses that sell pot with limited options — and has created a huge issue for the state, which is now attempting to figure out how to tax industry sales and mitigate public-safety issues that are certain to arise from people carrying around huge amounts of cash. Advocates are hoping a public bank could be the solution to that problem, and some say Oakland could be the epicenter of the industry, flushing the city with new economic opportunities. In fact, he said large inflows of capital from the cannabis industry could help start and secure the bank, ultimately providing more opportunity for community investment. Kaplan agreed. “If we have all the growers and dispensaries and retailers sharing a bank, we have a better opportunity for capitalization, that then makes everything else we are trying to do easier,” she explained. Still, even as the public-bank pitch continues to gain public support, several obstacles remain — both financial and legal, and including how a public bank might handle the threat of federal blowback. “A public bank — while a very seductive idea on the surface — quickly decomposes into a set of very thorny questions,” Schaefer explained. The city would still be on the hook to provide suspicious-activity reports to the feds, and comply with federal regulations. This could attract attention from the Trump administration, which has promised to crack down harder on recreational-marijuana states. Because Oakland is also a sanctuary city, it could become a higher priority target, as well. If the bank is capitalized with cannabis cash, and is at odds with federal law, it could also make it more difficult for the bank to obtain a charter. California financial institutions still must be shored up by the Federal Deposit Insurance Corporation, and most need a master account number from the Federal Reserve. Even putting cannabis-related issues aside, in order to obtain a California charter needed to start the bank, Oakland would need to make a strong case that it’s got a solid business plan, and has the capital to finance it, or a good management team to execute it. “If the bank doesn’t want to earn profits, that’s fine. But it has to cover its costs,” explained Dr. James Barth, a professor who teaches finance at Auburn University, and also serves as a senior fellow at the economic think tank The Milken Institute. He explained that the bank could quickly become insolvent if risk and return aren’t adequately considered during funding decisions. Specifically, he explained, if the bank takes on unprofitable loans intended to help the community, the riskier loans might be more prone to default and could run the bank into the ground. “Then, who would pick up the tab?” he asked. There are also questions of how a bank would be governed, or how priorities might be set. Even the Bank of North Dakota, oft-cited as a model for successful public banking, came under scrutiny last year for financing the police crackdown on Dakota Access Pipeline protestors, at then-Gov. Jack Dalrymple’s request. Also, the management team chosen to run the bank will be required to have strong backgrounds in finance but also be dedicated to the mission of public service. With little precedent, these dual qualifications might be hard to find. Despite the risks, and obstacles remaining, proponents are optimistic that the city will be able to navigate the challenges to build something that is better than the status quo. In the meantime, advocates have planned events for later this spring to keep up the momentum. Strike Debt Bay Area has partnered with Armstrong’s Commonomics to create a new advocacy group, called “Friends of the Public Bank of Oakland,” which is continuing to build a coalition of support from both individuals and East Bay organizations.